when I received a call from a dear friend. 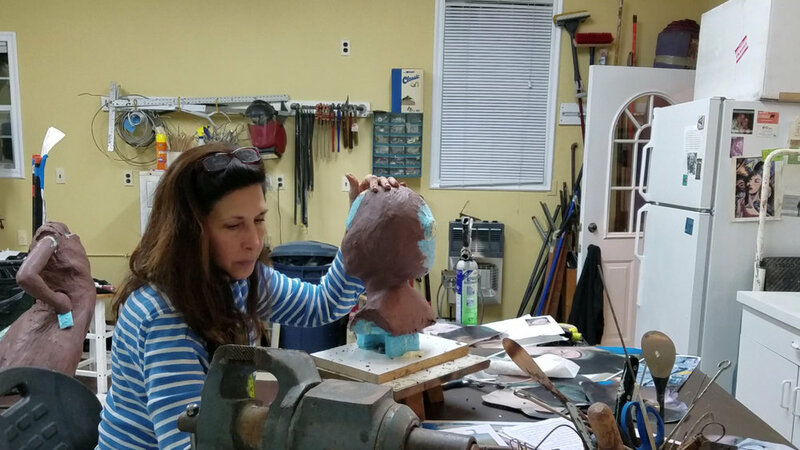 We had worked together long ago when I had apprenticed in Lost Wax Casting art casting. 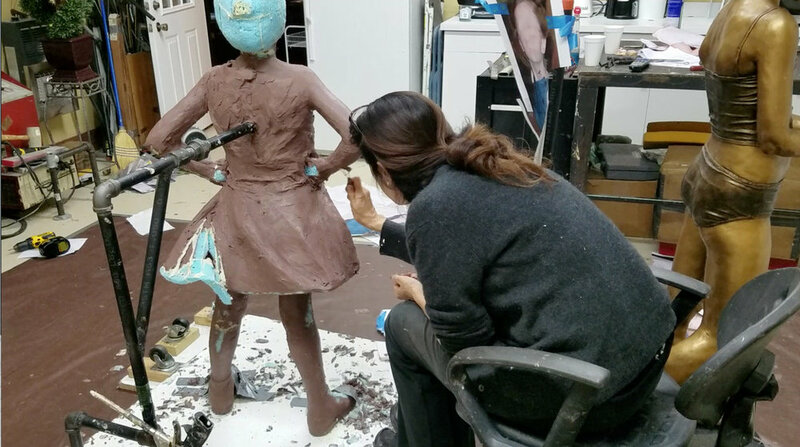 She had a client who needed a woman artist to sculpt a little girl. She didn’t say where and she didn’t say why, but she suggested that I should speak with this man as it would be good for my career. Her voice gave me pause and I consented to take the call. 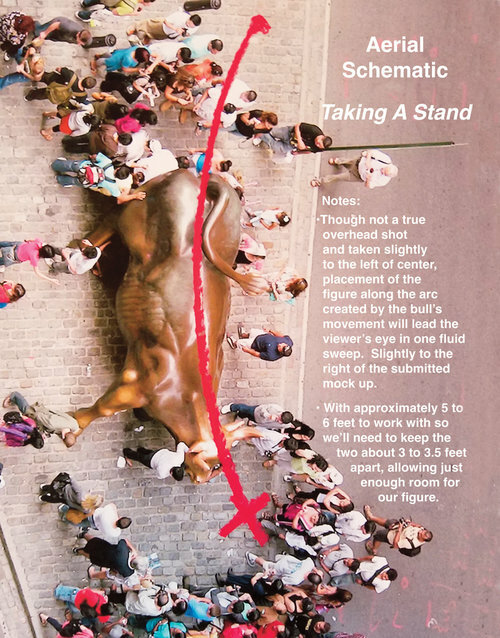 Sworn to secrecy, I was sent an image of a tiny little girl standing in front of Charging Bull, the iconic Wall Street sculpture. They needed the clay model by December 31st in order to cast it in time for International Women’s Day March 8th. How exciting! I was in! I could SEE her and I could do it! I had placed my Girl Chasing Butterflies at the Merrill Lynch corporate headquarters in Plainsboro, NJ in the late 90’s to celebrate Women’s History Month so, this was right up my alley. I considered it an honor to use my work to celebrate women. I imagined the public surprise and I smiled. Oh! This was going to be so much fun! 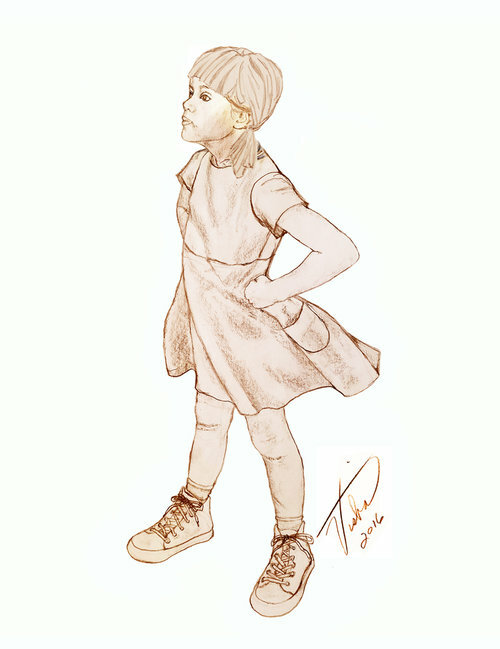 I submitted my first drawing to the McCann New York creative team on December 8th. Wonder Woman was our inspiration except she must be modern, a work that women of today would relate to. 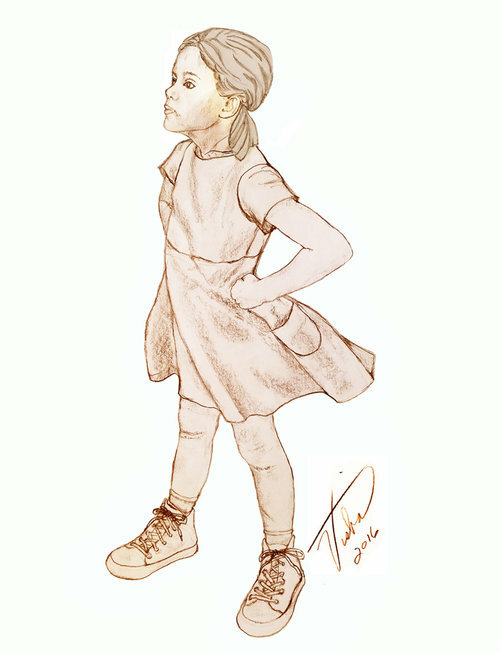 A simplified, streamlined dress was selected and high tops. Keep talking to me, I thought. I can SEE it! Of course, I’d have to incorporate a little wind to make it interesting, to give her style and sass. Besides, I was fixated with motion and incorporated it wherever I could. I suggested a larger work. This was, after all, a LARGE bull I said. We went 15” larger. That meant more time and I had no time but, it didn’t matter. It had to be right. Fabulous contrast – human to animal, tiny to large. We needed balance too. 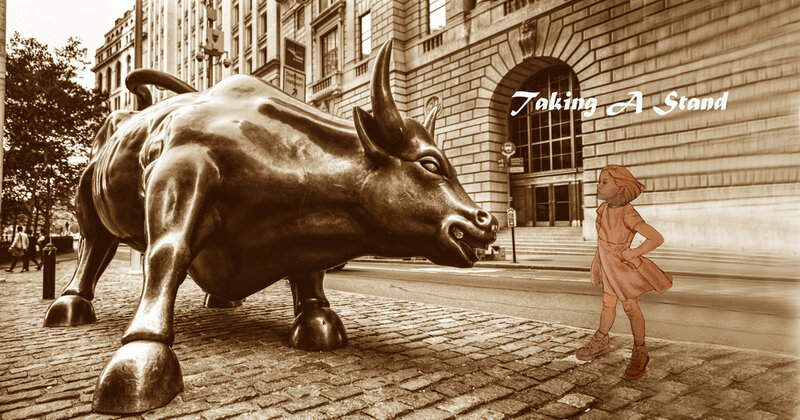 The plan was to sneak out at night and place the work just as Charging Bull had been placed, quietly delivering the work to the people. I was so excited! We ALL were. 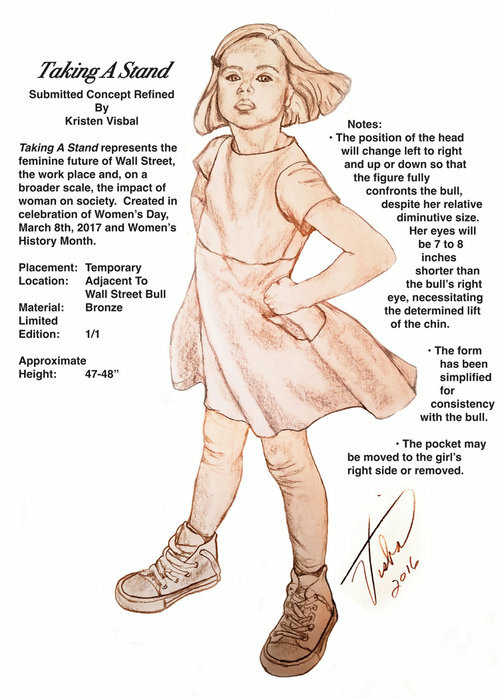 There was a handful of women from McCann New York who were key to the creation of Fearless Girl. Lizzie Wilson, Tally Grumbacher, Christine Lane and Neena Koyen worked tirelessly to ensure the success of our project. 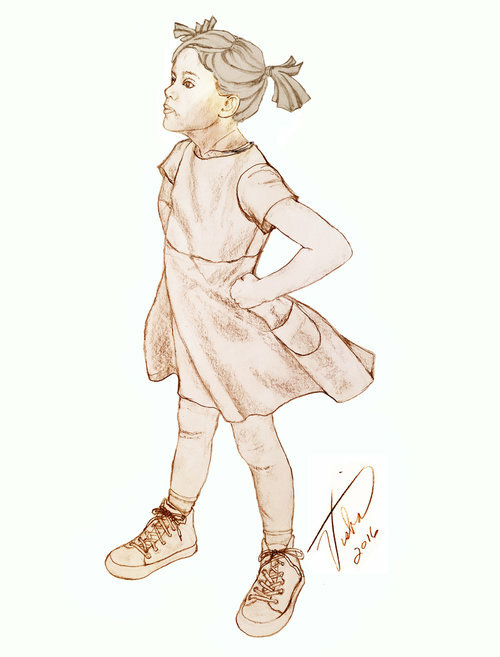 I gave Fearless Girl her look, her style and added my own flair but, the idea was born of these women. These few ladies, working in a Caucasian-male dominated industry, were itching to do something with a work that had stood proudly solo for nearly 29 years. Don’t get me wrong, there were nearly 30 people on the project committee, both men and women. This was a Herculean effort to get the permitting we needed to move forward with our venture. This was an example of success in collaboration, both men and women working together to realize something remarkable and significant. We decided on a 48” child and within a few hours I’d called a friend 2 hours north and was in front of her beautiful young daughter! I showed her how to stand and told my little model to imagine she was standing in front of a great, big bull. What happened next was perfect. This saucy little girl listened and assumed position with such attitude I told her to freeze and photographed her all the way around. Her chin was lifted with confidence and her entire body posture was EXACTLY what we needed for the work! I began sketching. Remember what Fearless Girl stands for: Collaboration for a better environment and better decisions. 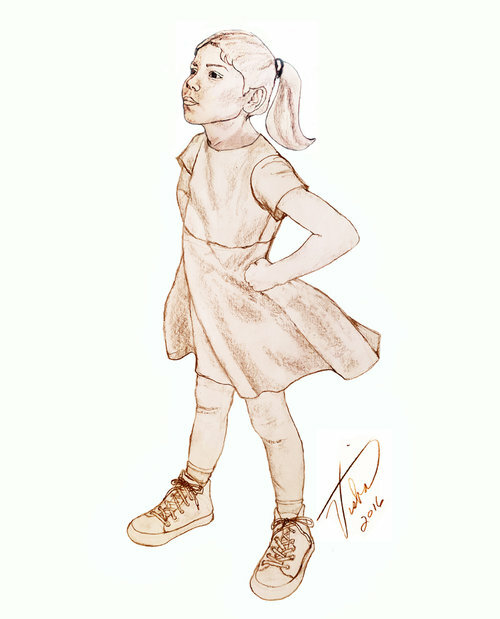 The creative committee and I collaborated in order to develop the best possible Fearless Girl. We wanted modern, we wanted universal appeal and the decision was made to find a Latina model. As providence would have it, just like the first model, I found the second easily. She was the daughter of a man who worked with another friend and lived 15 minutes from my studio. It was Christmas but, I called anyway. She came for the studio shoot on December 27th and I did not begin sculpting until December 29th. In the end, I had created 11 sketches, variations on the same theme and I was in a bottleneck situation. 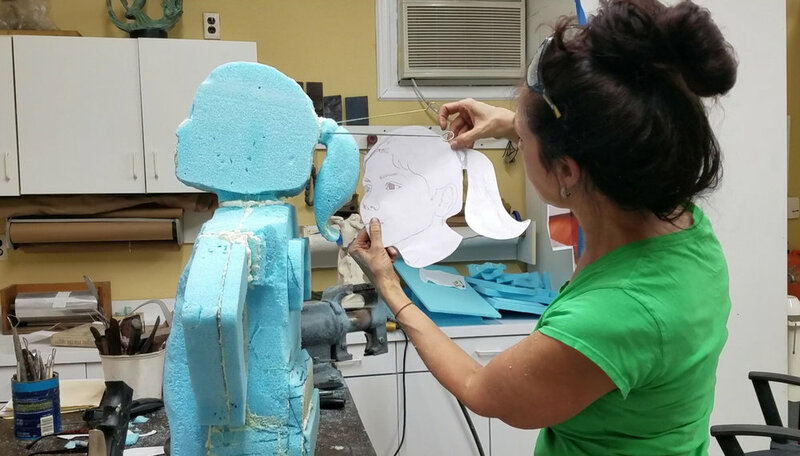 Originally, the clay model was to be completed by December 31st but, we’d spent the month refining our idea. I’d been here before. Creativity under extreme stress. I left the studio New Year’s Eve at exactly midnight. Fireworks were going off over the field and I smiled. Ok. So, maybe I’d missed the holidays but, there were other years. The problem is I’d decided to approach this sculpture differently. I was hoping I’d get it done faster- not so! I began by gluing layers of pipe insulation foam together to avoid building a metal armature and sculpted using pneumatic tools with grinding stones attached. 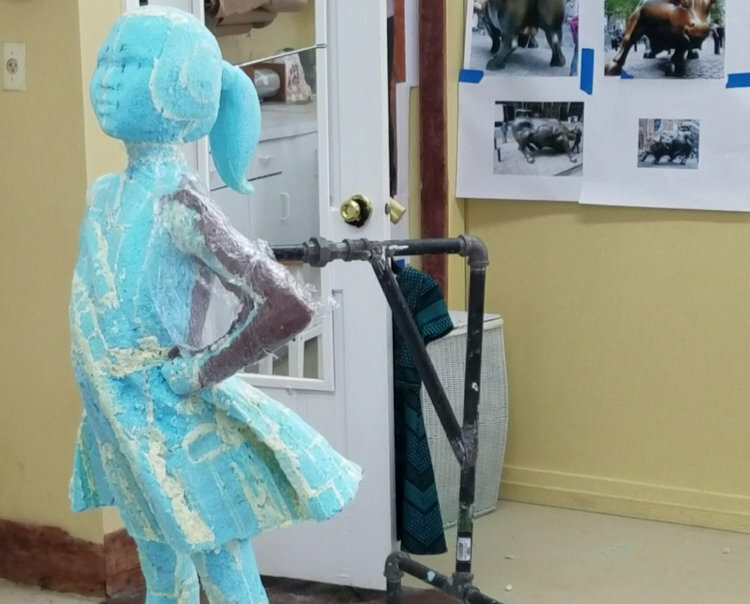 The skirt was made by scoring sheet foam and filling the cut with an expanding foam glue which I could carve once it had set. I changed the skirt at least 3 times and each change took a day to orchestrate. It was a long process and everyone was getting antsy. 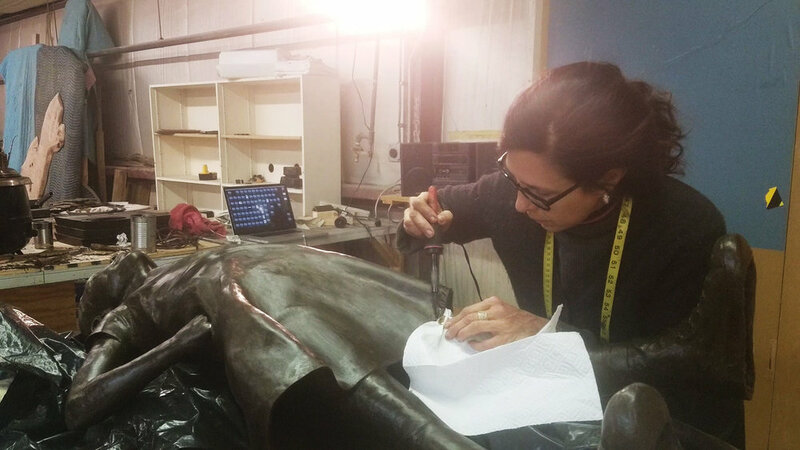 I was working around the clock but, Fearless Girl was completed in 2 1/2 weeks. No time to double check my work. The final three days were spent in someone else’s studio near the mold maker. I booked a hotel, but worked through the night instead. Saturday night I submitted photos of the completed work and finally caught a few hours of sleep on the floor. The things I did for art! I finished the day of the women’s march in Washington, DC and I found that incredibly ironic. Friends and family were marching. Working in the studio, I had time to think about what this work stood for. Gender inequality still exists worldwide, even after woman have been given the right to vote. I realized how insulated I had been working in the studio all of these years. Fearless Girl was educating me, making me aware. I was glad we could use my art to call attention to this issue and proud that I’d created her. State Street Global Advisors, a mammoth Boston based asset management company and long time client of McCann’s, had been looking for a way to bring their gender diversity initiative to light. Fearless Girl was perfect! Their elegant lead in the global discussion on gender diversity in corporate governance, gave enormous weight to the Fearless Girl project. Fearless Girl became the poster child for the empowerment of women. Numerous gender diversity studies vindicate women and prove their worthiness in the corporate domain. Business is waking up to the power of women, specifically in leadership. Gender diversity leading to smarter business decisions and companies that are more productive, and more profitable. Armed with information like this, women were on fire and so was our little Fearless Girl. The sculpture highlighted global issues society had long overlooked. It is time. Time for women to step up and embrace their power, their critical role in the evolution of our global society. Establish the competitive edge: Incorporate Women. Simple logic, it seems to me. Certainly, the more diverse a group is, the more fruitful their collaboration. Men and women, generally speaking, ARE different. Maybe it’s genetics and maybe it’s socialization but, the end result is the same. Genders employ different problem solving skills and blending them is more effective. Proof positive men and women are a perfect complement to one another. Lose the antiquated prejudices that relegate women to domesticity and evolve. 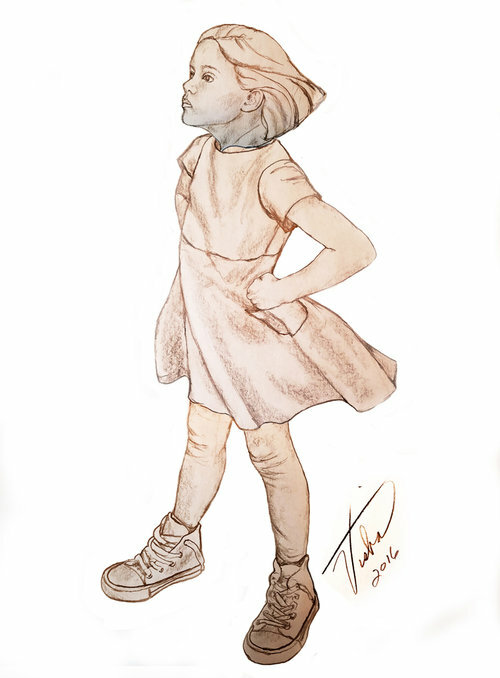 Collaboration is the underlying message of Fearless Girl and her obstinate pose demands attention, inclusion. It just so happens, inclusion of women, in every way, in every facet of society creates a life that is richer, more effective. It’s not about Women’s Rights, it’s human rights. Open your eyes and your minds. Appreciate the differences between gender and culture and harness them for growth and prosperity. In the end, our little lady generated an estimated more than 38 million in press. She’s ruffled some feathers, but in my opinion, should remain right where she is until the pendulum swings and we see gender equality worldwide and, as long as Fearless Girl remains at Bowling Green park, she will remain the beacon for the benefits of diversity.